Every blogger should learn about what is Keyword research. If you are a blogger than "Keyword research" and Google Keyword planner are not new terms for you and if you don`t know about this that means you are missing the basic of SEO. We turn quality content into optimized content with the help of SEO with High CPC Keywords. Because optimized articles rank goof in search engines. This create need of OnPage Optimization SEO. OnPage optimization start with keyword research. Should use the keyword that have some search volume means people search for that keyword. Even when many bloggers write quality content still if they are not able to drive traffic from search engines that is because they are not using right SEO optimization techniques. Today I will talk about how to use Keyword Planner tool for researching keyword. If you are not sure about the importance of the keywords before writing blog posts, you should read Importance of Keywords in SEO. So we start with the basic. In common words, process of identifying Keywords which get good search volume per month. Reason of doing this research is to find Keywords that give maximum traffic and less competition. We can take this example, if you search for "SEO WordPress Plugins" and "WordpPress SEO Plugins" both shows the different picture of their traffic. With keyword research you will be able to get targeted traffic for your blog and more revenue. 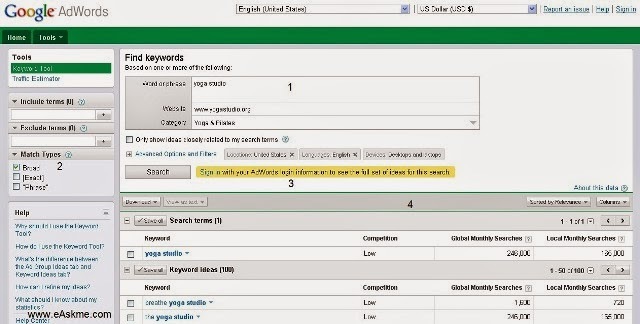 You can analyze competitor site to find keywords. Doing keywords research can drive unlimited traffic. Google Keyword tool is a product of Google. This give traffic estimation of targeted keywords and help finding related and relevant keywords. This is where you will put target keywords. We should find keywords that have good traffic and low competition. Keyword research Broad match help me to target long-tail keywords. You can use this when you need keywords in exact phrase. This allow you to add more filter in your search like country, language, target device. Competition : This tool show competition among advertisers who are bigging on that keyword. Global Monthly Search : This shows the average of search done in last 12 months for that keyword. Local Monthly Search : This show the search volume of the keyword based on your filter. Approximate CPC :This show approx CPC of keyword for advertisers. 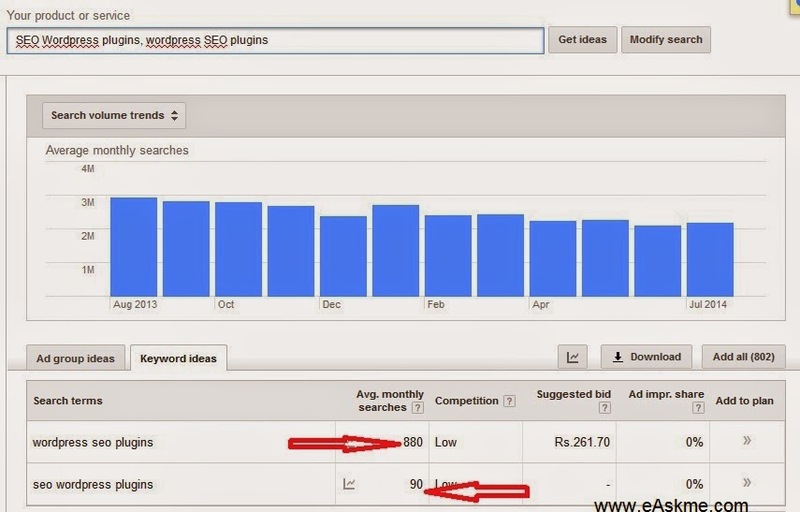 It`s good idea to find high CPC keywords with low competition. Now as you know about Google Keyword Tool. Now job is to find high or medium traffic keywords with low traffic using Google Keyword Research Tool, Google Search to traffic travis. You can also check keywords in Google Traffic trend. Google Instant search is like a keyword discovery tool, that give you thousands of ideas. You can use all of them but you will know what are the keywords. for example if you type for WordPress SEO. It will show you few suggestions. According to your post you can choose which suits you best. Once you have 4-5 keywords, add them to Google Keyword Suggestion tool and search. Now find out which keyword will give you benefit on traffic. Now put Keywords in search box and perform search. Now you will see relevant keywords that you can target in your post. I personally prefer to target 2-3 keywords per post. But you can create you own strategy. There are many Keyword competition checker tool available online. I prefer to use Traffic Travis and SEOmoz Pro. You can download Traffic Travis Software on desktop and run it then go to SEO and click on "Competition" tab. Enter keywords and search. The resultt also show you domain age, backlinks, page rank, DMOZ submissions, On paeg SEO and many other factors. Click on "View Details" to see results. Now your target should be writing a keyword optimized srticle or you cna find more keywords and write than. Even you can do this on your old posts that you have not optimized till now. Search keywords and edit them according to that. I hope this Google Keyword Planner guide help you to find best keywords. If you have any question or query, feel free to ask.